Kids, Cows and Grass: Honey bees on a ranch -- the REST of the story! Honey bees on a ranch -- the REST of the story! A few weeks ago, we were finishing up renovating a 120 year old barn that we use everyday. It is where we store feed for our cattle, our tack for the show cattle and it houses 4 stalls for calving heifers. The barn is not only historic, but is also important to our ranch. We have been working to restore and strengthen the barns on our ranch, and this one is the last one. The guys working on it were putting off finishing the north side, as we have a colony of honeybees in the siding of the barn that have been there for 40 years. Finally my husband found a bee keeper interested in relocating the bees to his place and we called off construction work for a week to let the bee keeper work his magic! When he arrived, Doug unloaded a square wooden hive, a crowbar, a hammer, and a hive tool for bee keepers. He put on a bee suit, complete with a bonnet to protect his face and head, but he didn't put on his gloves. As he worked, he explained about bee keeping. This is all brood chamber. The honey is above and hadn't been exposed yet. Doug used a skill saw to cut away siding and expose the comb. 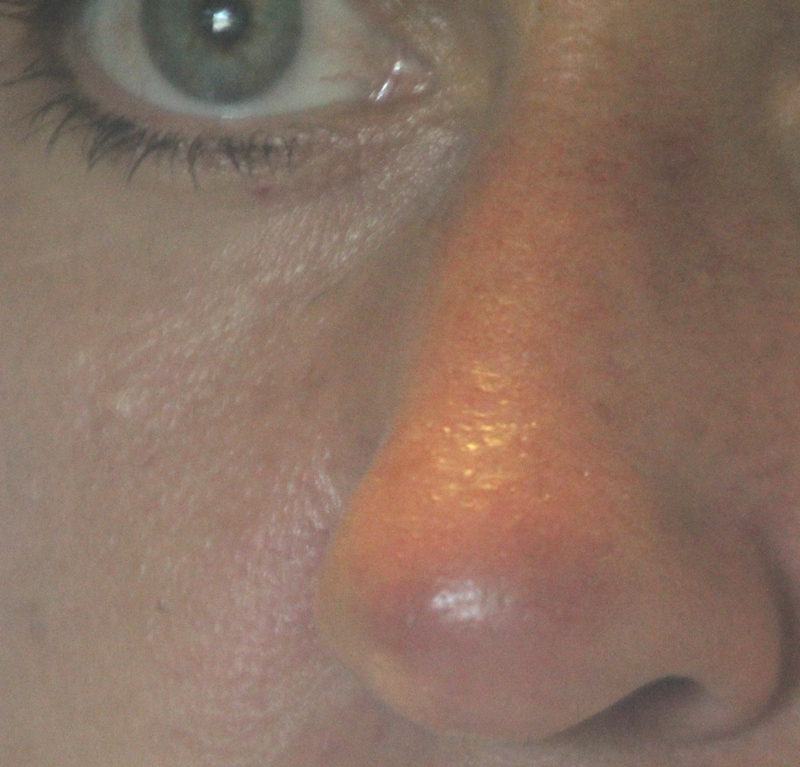 Honey bees have an acute sense of smell. He said that the smoke doesn't really calm the bees, it merely masks their ability to differentiate smell. So when he begins work with a skill saw to cut the siding of the barn apart, and the bees release their alarm pheromone, the others can't smell it and therefore do not get upset. They just keep doing what they were doing, allowing Doug to search for the queen. In order to move a colony, you must find the queen bee, as the rest of the bees will follow her. Each hive must have a queen, and they keep her located by her smell. She is usually in the brood chamber, which is honeycomb filled with eggs at various stages of development. Above the brood chamber is the honey, which is the bees' food source for winter. 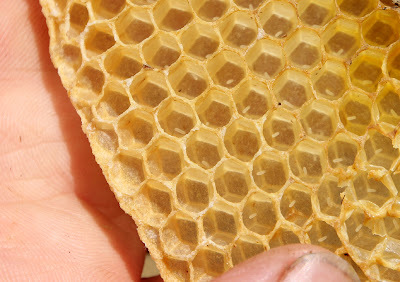 The rice shaped eggs at the bottom of each chamber in the comb are approximately 2-3 days old. 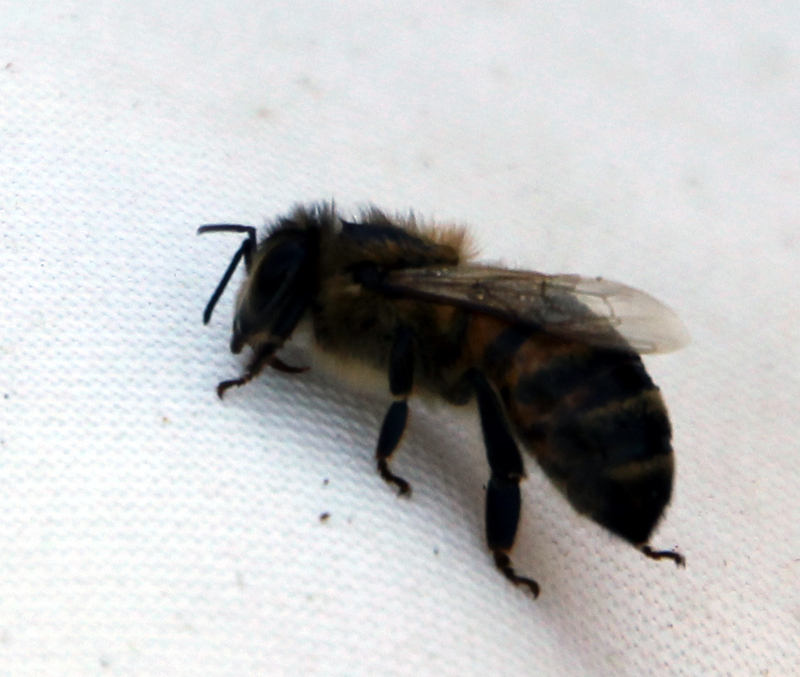 As Doug searched carefully for the queen, a larger bee with distinctively lighter colored body, he removed the brood comb and the honeycomb, saving the honeycomb in clean 5-gallon sized buckets. He explained that the bees flying back and forth to the hive are all female bees. They are called worker bees. They bring nectar for honey, collect pollen to feed the young, take care of the young and do all the work associated with running the hive. The queen's job is to lay eggs. A worker lives only six weeks, while a queen lives three to five years. She can sting repeatedly because her stinger doesn't have a barb on the end of it, but she rarely stings a person. She reserves her stinging for fighting other queen bees. A worker bee can sting only one time, and then she dies, as her stinger is barbed and is pulled out along with the venom sack and associated muscles. Before anyone was stung, Doug explained that you should remain calm as bees really can smell fear and anxiety. If you are stung, do not try to pull the stinger out as you will only empty the venom sac into your skin and cause the pain to be worse. You should use a knife or flat edge of a credit card to scrape the stinger out. During the day working with the bees, Doug never put on his gloves, but continued to move the bees and honeycomb with his bare hands. He said this colony was very calm, and he remained calm and quiet as well. He was stung a time or two, but he said other than the original sting it doesn't affect him anymore. He has become desensitized to bee venom. While watching Doug work, I was stung once--which is amazing as there were bees flying all around us. I realize that if I had not become afraid, the bee wouldn't have stung me, but I eventually swatted at it, and it stung me on the tip of my nose! Okay, enough of my drama....Another bee found in a hive is a drone. The drones are male, and as Doug explained, their only purpose is to mate with the female. They eat pollen and honey, and mate with the queen one time, then they die. If a colony is in danger, it is the drones that are sacrificed to save the colony. After searching for nearly two hours, Doug suddenly came across the queen. She had gone into an empty space between the studs on the barn and he followed the bees who were following her. He carefully held her in his hands and carried her to the new hive. He said, the queen rarely stings people, but reserves her aggression for other queen bees. Once he had her in the hive, he put some honeycomb in with some other bees and closed the lid. 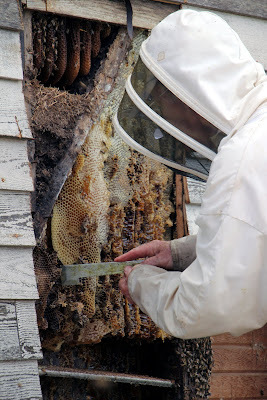 We moved the hive to a location close to the barn and while the queen settled into her new home, Doug finished removing the honeycomb from the barn. As he did, he shook the bees from the comb. They remained calm and didn't attack or sting him. He remarked that these bees are obviously not Africanized, as they were not aggressive. He said there are a couple of colonies of Africanized bees in Kansas along the southern border, but they don't seem able to survive the cold Kansas winters. So until they become adapted by breeding with local bees, they might not move north. When the comb was removed, and the queen settled in the new hive, it was obvious that the rest of the bees were becoming confused. They were beginning to mill around, moving throughout the open cavity where honeycomb once was. Doug said that they probably sensed that the queen was not there. He said that if the queen dies or is lost in an active hive, the workers sense her absence. They will select a few two or three-day old eggs and feed them royal jelly. The simple act of changing their food will create larger bees with different characteristics. The first one of these eggs to hatch will become the new queen and she will destroy the other bees being raised to become a queen. A hive follows their queen and must have one to survive. In order to move the worker and drone bees into the new hive, a bee keeper uses the bees' sense of smell. Doug swept piles of bees onto a board and put them in front of the hive opening. As they moved around, they could smell the queen inside the hive and dutifully marched into the new hive to find her. He left the new hive there for a couple of days and when he came back to pick it up, they had begun building new honeycomb already. Doug said that moving a colony this late in the season is not ideal, as they will not have enough honey stored by winter to feed themselves. He said he has a hive that is not as strong that he would like to merge these bees with, in order to strengthen both colonies. In order to merge two colonies, they must get used to then scent of the other bees. If they smell another colony, they may kill them if abruptly put together. So he puts the hives together with newspaper between them. As the bees shred the newspaper, they get to know each other and their smells. Once they have commingled, the queens must determine which one will stay. They will fight to the death and the one alive will rule both colonies that are by that time merged into one. Doug said he does often mark his queens to keep track of them. He can place a small dot on her thorax, or the middle portion of her body that is covered in a hard exoskeleton. Doug has purchased queen bees of Russian ancestry to breed in more hardiness and resistance to certain diseases. The biggest product of Doug's bees is, of course, honey. He sells the honey from his hives at the local farmers market in Junction City. This year, due to the heat, the honey production was dramatically lowered. He usually harvests nearly 600 pounds of honey, but this year only harvested 150 pounds. From our barn he pulled 4 buckets of honeycomb. He took home one bucketful, one of the guys working on the barn took home a bucketful and I had two bucketsful. The comb that I took home yielded 32 pints of honey. Doug explained that honey does not need to be heated to be sanitized or canned. It is naturally resistant to bacteria. He recommended squeezing the comb to break it and then allowing it to drain through a screen to remove the honey. Then put it in jars for storage. He said honey can keep for a long time, even if it crystallizes. It should then be heated to melt the crystals. Doug said that honey was found in some tombs in Egypt and it was still good. At the end of the week, the honey was collected, the barn sealed up so bees would not try to build in it again, and the bees successfully relocated to the new hive at Doug's place at Junction City. The guys were able to safely finish work on the barn and hopefully it will remain strong for 120 more years. For more pictures, see my previous post immediately after the bee-moving event. 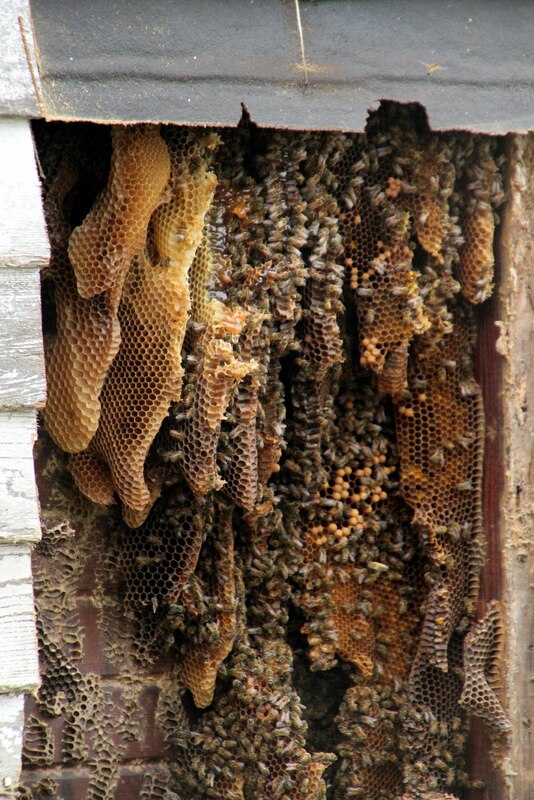 It was Wordless Wednesday - Bees, bees, bees on a ranch. I knew how important bees were to crops and plants, etc...even though I don't like them! That was so interesting! Thanks so much for sharing...I had no idea they were so fascinating. Thanks for enjoying it! I didn't know they were so interesting, either. I think our bee keeper really enjoys teaching, though. It made for a fun day. Debbie: I'm not saying I LIKE bees either, but I do see how important they are to us. Also, the honey we got is awesome! And, by the way, I'm so glad I'm from WC too! Love this town!! Great post Debbie! I know i learned all of this in middle school. We even had some hives on the property. Hope to see you lot's more and yes rural women Rock! this is so interesting. We eat a lot of honey and my son is always interested to learn where it comes from (me too, actually) thanks for sharing. We have loved eating our own honey from the bees in our own barn. We only have a few jars left and I am thinking I need to find a new source of local honey! I learned so much when the bee keeper came to collect the hive. I wrote an article for the local paper and a larger paper nearby. It was so informative--and I genuinely learned so much! Thanks for stopping by!